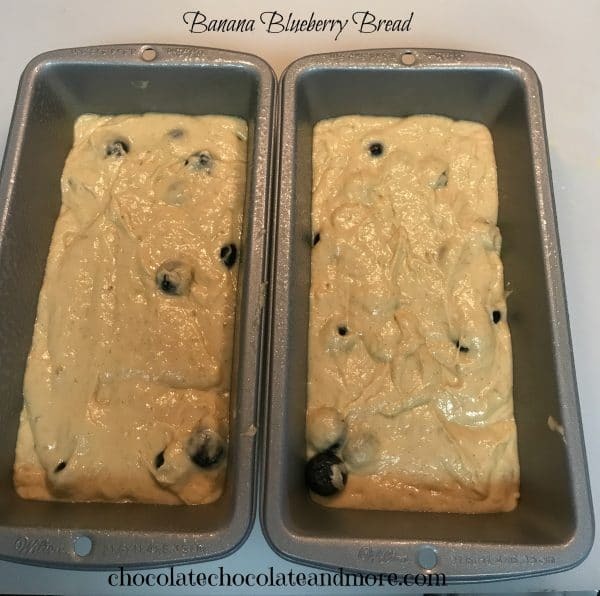 Banana Blueberry Bread - Chocolate Chocolate and More! Banana bread has always been one of my favorite “comfort foods”. I love it plain or with something added, cold or heated up with some salted butter melted on top. It is great for breakfast or a snack. Really, it is pretty much perfect for anything. 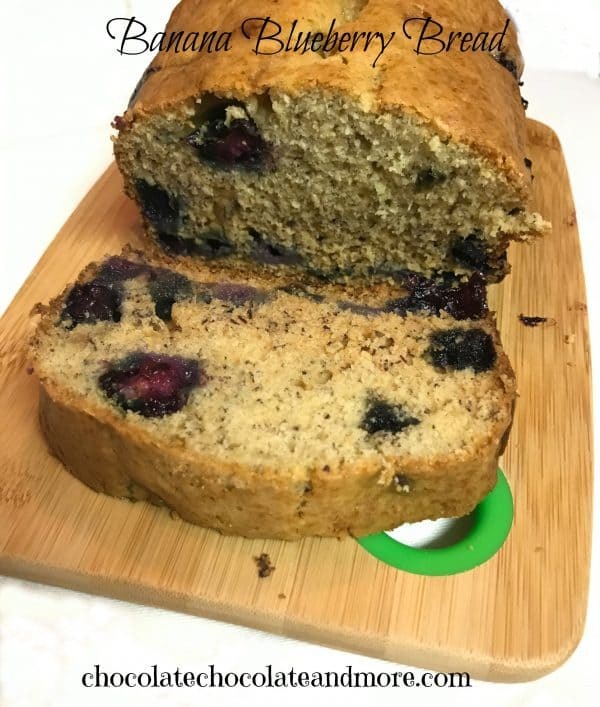 I was listening to Sirius NASCAR radio on the way into work the other day, and one of the hosts mentioned that he was having some of his moms home made Banana Blueberry Bread for breakfast during the show. 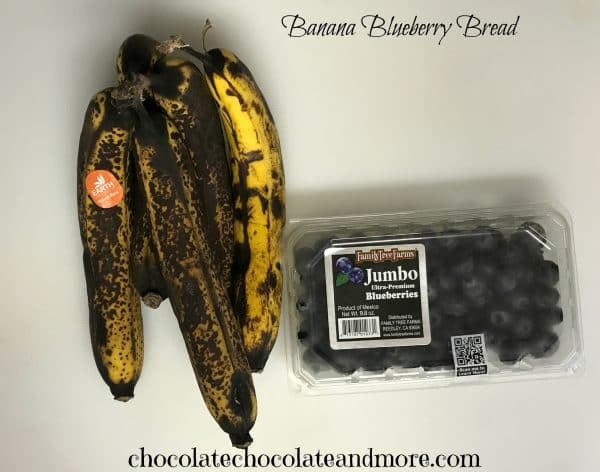 That was something new to me — I have heard of blueberries with lemon loaf, but not with banana bread. But it makes sense — I mean, you have them both on cereal — why not in a loaf? I had been planning on using a few well browned bananas to make banana bread anyway, so all I needed to do was swing by the store and grab a pint of nice, ripe berries. And oh man, the end result is absolutely delicious! The nice thing about this recipe is you can use any size or shape pan, or make muffins. It is up to you. In this case, I used two 8.5″ x 4.5″ loaf pans, and they were perfect for two nice sized loafs — one to keep and one to share! If you don’t want to share the second loaf, you can freeze them in an airtight container for a few months, and take it out on an as-wanted or needed basis. Regardless of what you do with the final result, I hope you enjoy this recipe as much as I did! Rinse blueberries and pat dry - set aside. In a medium bowl combine flour, baking soda and salt with a fork or spoon -- set aside. In a large bowl, mix softened butter and sugar with a stand or hand mixer, slowly going from low to medium-high speed mixer until light and well combined (no large chunks). Change mixer to medium speed and add eggs one at a time, allowing to be completely blended with sugar and butter mixture. Blend vanilla paste into mixture. Add mashed bananas into mixture and thoroughly combine. Decrease mixer speed to low and slowly add flour mixture into the wet mixture in small portions, mixing until combined. Using spoon or spatula, gently fold blueberries into the batter. Pour batter into greased loaf pans and place into oven, baking 30-35 minutes or until a toothpick comes out clean from the center of the loaf. Remove from oven and allow to cool in pans 15 minutes before turning out onto cooling racks. Slice and serve warm or completely cooled. I have 3 bananas, wrapped in foil, sitting in the freezer, now to get some berries. The final product will be shared with the couple I work for. How did it turn out? I hope everyone enjoyed it!